NYTimes: Dersu, marvelously played by Maxim Munzzuk, a Soviet Asian, draws his wisdom from his complete openness to the natural world. The openness means vulnerability as well. The captain, whose relation to the old man is a growing reverence, discovers him one night, broken with grief by the fire. He is remembering his family, dead of smallpox; and he has no barriers against remembered pain—it is as real as a tree falling upon him. In the climactic scene of this first part, Dersu and the captain go out to chart a frozen lake. Kurosawa films the cold as it has rarely, if ever, been filmed. It is a visible, red-eyed enemy, visibly terrifying. decentfilms.com: The unspoiled vastness of the Siberian wilderness, so utterly unlike the modern Japanese landscape with its cultivated forests, offered a radically new canvas for Kurosawa. Always a powerful visual stylist, Kurosawa crafted some of his most striking imagery for Dersu Uzala, especially in a numinous, eerily lit confrontation with a tiger. The director’s characteristically kinetic flair for action is here, but instead of erupting in violence it finds expression in a breathtaking sequence with Arseniev and Dersu frantically struggling for survival on a frozen marsh with the deadly cold of night coming on, and also in a gripping episode with Dersu accidentally set adrift on a raft in dangerous waters. 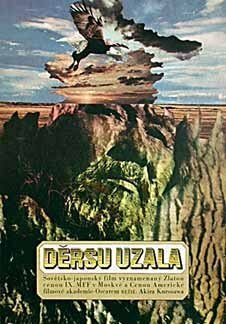 Slant: Kurosawa was 65 when he made Dersu Uzala, the same age as Munzuk. Though it won a foreign-language Oscar, the director was on the downside of his long career, having experienced commercial failure, made an unsuccessful attempt at directing a Hollywood film, and tried to kill himself. Maybe he identified with Dersu, an aging nomadic hunter whose way of life is fading as fast as his eyesight. In any case, his empathy for the man is evident, as is his respect for his decency and wisdom. In the forest where he has spent his entire life, Dersu is the ultimate natural man, understanding everything and everyone. I love this movie. The scene where they have to survive the night in the storm, holy cow. And the friendship between the two men. It's not like the end comes as a surprise, but it still hits you like a ton of bricks. The film is very simple, really just the story of two men doing their jobs. But that's like saying Hamlet is just a murder mystery. *recalling a friend who, after a lifetime of hearing how great Citizen Kane was, finally saw it on a 14" TV screen, cut up by commercials, and didn't understand what the fuss was all about. That scene midway through the movie where they come across each other once again in the forest is one of the sweetest on film.